For Easter this year, my mom and sister came up to visit, and we enjoyed family all together on Sunday for Easter supper. 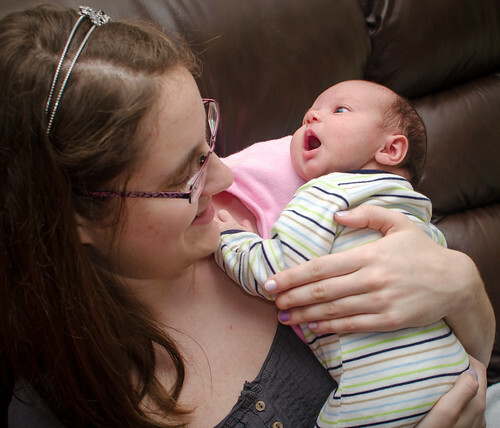 This was Aunt Holly’s first opportunity to meet Coraline! 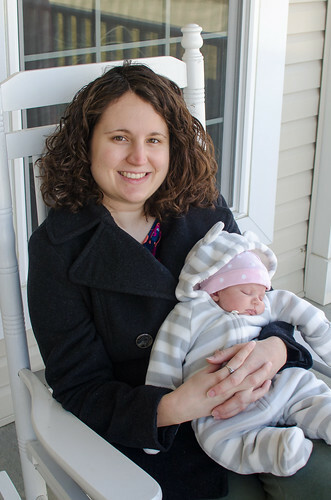 The weather was looking up a bit, so we spent some time outside on Saturday with Coraline all bundled up. 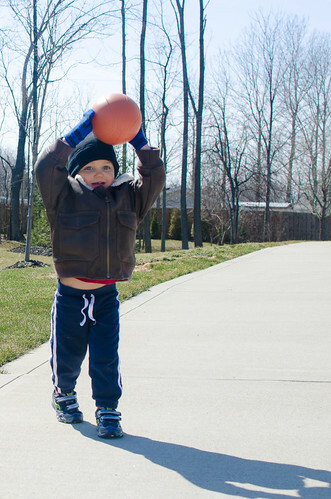 Jameson loved playing basketball with Aunt Holly (it was mostly just throwing and playing catch, but Jameson has taken to calling that basketball). 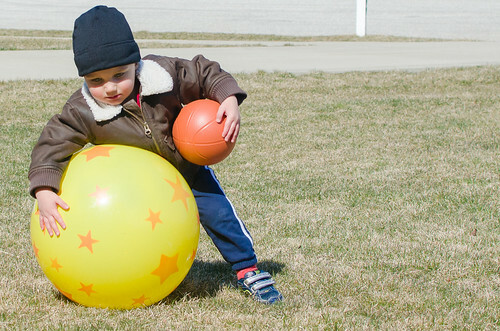 Meemaw brought the extra large bouncy ball! It quickly blew through the yard on the windy day, and I’m pretty sure Jameson encouraged some of that blowing away so they could run down the street chasing after it. 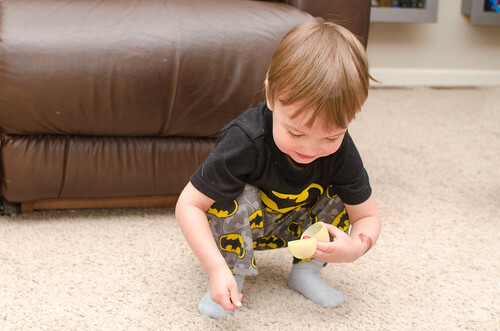 On Easter morning, Jameson very quickly saw an egg and understood the name of the game. He took a quick break to eat some breakfast midway through (thankfully, since he enjoyed eating a jelly bean or two from each of his eggs). 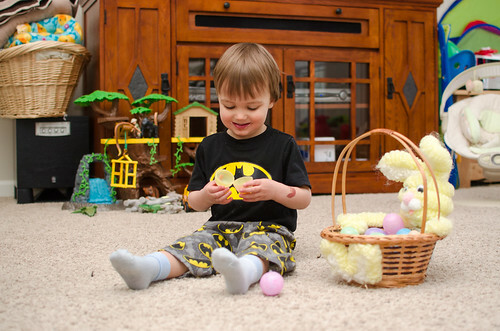 After finding all the eggs (18 eggs, filled with jelly beans, chocolate which he insisted he didn’t like, and 3 little cars), then it was time for the Easter baskets. 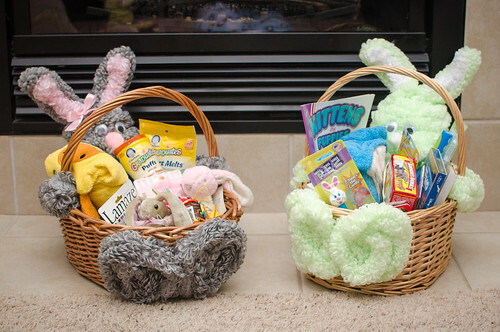 Both Jameson and Coraline have Easter baskets; Coraline’s basket is gray and pink, and Jameson’s is green and white, made from loopy chenille which is now a discontinued product and hard to find. The yellow basket you see in the photos above is my basket from my childhood. Coraline got a giraffe hooded towel (kid-sized, so I expect Jameson will use it before it fits her! ), a baby toy with mirror, small stuffed bunny, bunny rattle, puffs and yogurt drops for when she is introduced to food, a bunny rubber duck bath toy. Jameson’s basket had pez and animal crackers, a shark hooded towel, coloring book, 3 mini reading books, flashlight, puzzle, and Finding Nemo. Finding Nemo did not overtake his love of the Lion King, but he did sit through most of it. Meanwhile, Brian made a breakfast casserole for us. After all that activity, we didn’t make it in to church, but I did have everyone dress up for our first family photo post Coraline’s birth. 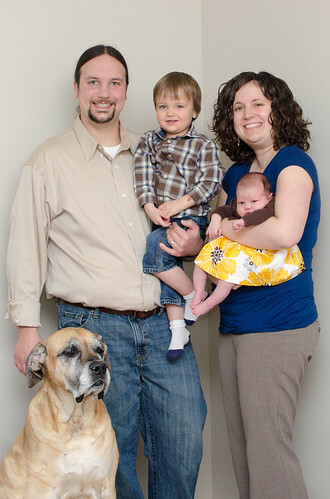 Contrary to this lovely photo’s appearance, it was much much harder to get everyone looking at the camera and smiling. And by everyone, I mean Jameson and Sasha (I didn’t expect Coraline to be looking at the photo, though by some miracle, we captured a photo of her looking at the camera and not screaming). This was actually the only photo we got of Sasha in the frame as well, since she kept insisting on laying down. Jameson was concerned about Coraline crying and the rush of the photo, and kept sticking his hand in dad’s pocket until we let him take a few of the photos himself. I think everyone (including my belly, which was stuffed into those pants temporarily) was relieved when we managed to capture a couple good photos, and we were finished. 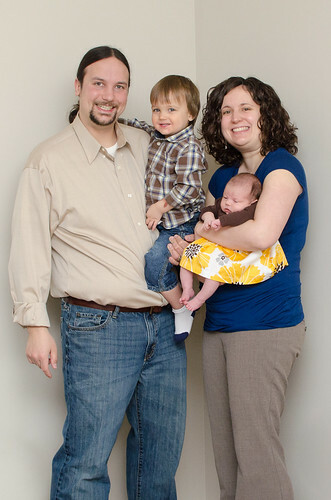 These family portraits are important though, and I am happy we managed to take them at least twice a year. Brian’s parents and sister came over then for supper. 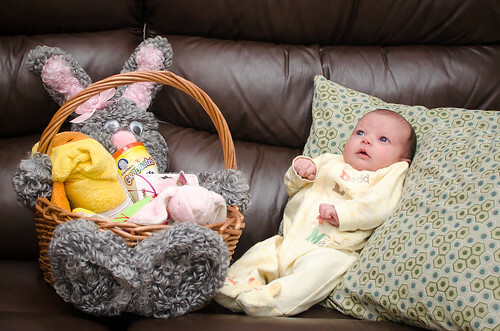 They brought over more Easter goodies for Jameson and Coraline, including clothes and toys and candy for Jameson. 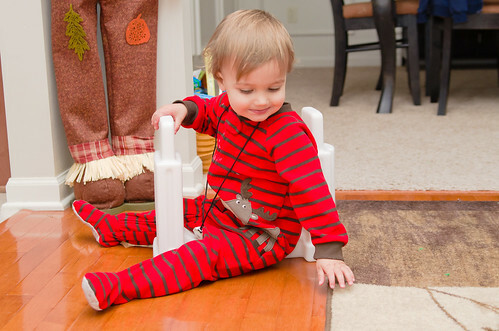 Jameson’s fascination with spinning things made these tops a hit. For supper, we had ham and turkey, salad, potatoes and green bean casserole, and fruit pizza for dessert. 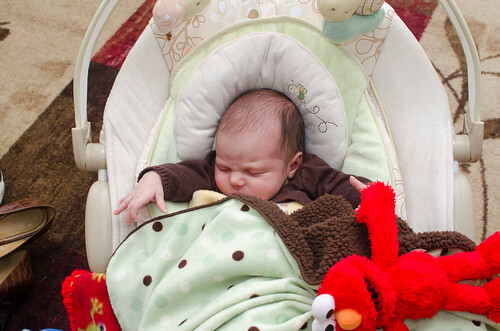 Coraline was sleeping off her own supper time in the bouncer. After taking a couple photos of Jameson’s stash of blankets and toys on top of Coraline, I came back just moments later to find her head actually covered up under two layers of blankets. Ooops! We had to tell Jameson he can’t cover her head. It is so nice of him to share his toys though, so we encourage that particular behavior and I love the way he wants to keep her warm and seems to believe it will help her sleep, just like they do for him. After our nice family dinner, Meemaw and Aunt Holly had to leave and we relaxed for the evening. Everyone was exhausted! It’s that time of year again! This year I got an early start on making up a list of toys and games I thought would be appropriate for him. In the tech toys, staples are the kid size versions of laptops and cameras, or even the kid-proof case for your own ipad. If you’re strapped for cash, Jameson also has a recycled mouse (cord cut) and keyboard that he enjoys pounding on and standing on. There are cheaper kid cameras than the one here, but I like this one since you can swivel the lens so you can take pictures of yourself. I take a lot of photos, and Jameson frequently takes my iphone to say “cheese” (and also “hello”; glad he recognizes it’s a phone too). I figured this is a little beyond his abilities right now, but it will be fun for him to grow with over the next year. I liked this music player because you can add real songs to it and it will hold up to abuse. I would consider getting some kind of headphones too. This kind of gift will work well for next year too! Does your child like to get the mail? I started a subscription with Jameson’s name on it, that I was really hoping he’d get into. So far, no dice, but I still think he’ll enjoy getting mail just for him this year. Specifically, I’m talking about books that relate to daily activities like brushing teeth, switching to a new bed, going potty, and eating vegetables. Jameson has really enjoyed reading about these types of life activities that he can really relate to right now. The matching game is a really relevant gift for his age, and a step up from the regular blocky puzzles they probably already have. You can just do a couple cards at a time to not overwhelm them. Of course, a magnadoodle is at your discretion. If you pick one, I would definitely make sure it doesn’t have loose magnets. Jameson is great about not putting things in his mouth yet, but I wouldn’t trust him that far. I like the fact that he can doodle and draw with this without much supervision at any time. Art doesn’t have to happen at the kitchen table. Since he’s not great about sitting still, I am hoping this will encourage him. And let them start carrying their own stuff! They’ll enjoy the novelty of it, I swear. In the puzzle realm, improve dexterity with a latch board type puzzle, or their letter and number recognition with the alphabet puzzles. I spent a long time searching for a vehicle that I thought would act for both regular play and puzzle/thinking skills. A lot of build-it sets are for older children, and I thought this one settled right where I wanted it to. I can’t wait to see how he interacts with this toy. 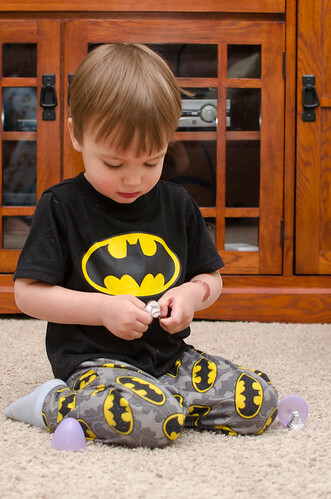 For pretend play, there is always doctor or vet sets (the vet sets frequently come with an animal, which is a bonus). We also got Jameson a wooden train set. I wouldn’t spend a lot of money on it yet unless you know your child adores trains, because eventually you’ll just upgrade to the electric ones anyway. 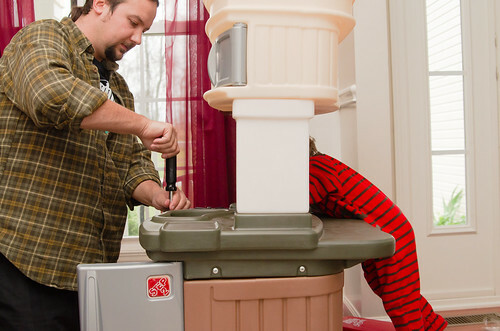 But it allows kids to build it and play with it, so it’s another win in my book! 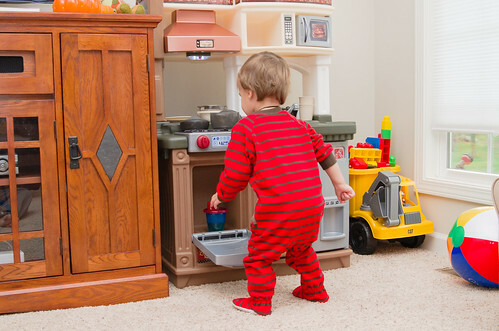 If the child already has a workshop or kitchen, then this will just enhance it. 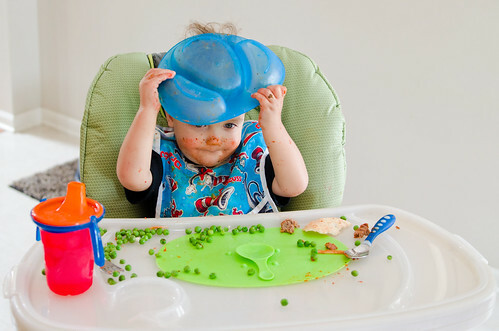 If not, play food works well on it’s own or with a little kid-size shopping cart. We’ve had fun teaching Jameson what “pretend” means. As I said, Jameson doesn’t play with a lot of his toys regularly, so this not-toy is right up his alley. It can be whatever he wants it to be! Which will probably be a hat, since he has been putting most things on his head recently. Jameson is into dice, which are obviously too small for him to play with without close supervision, so I bought him these hard foam dice just over choking size instead. The vacuum! You don’t have to spend a lot on the Dyson version; this cheap one Jameson has had for a long time already and loves. We are getting him his own little broom this year, and I am willing to bet it will be a top toy as well. Not to mention, it will continue to encourage him as my little helper! *I have not used or experienced all these products, but I think they’re great ideas. As always, consider your purchases carefully and note any age specific warnings and details. P.S. Looking for gift ideas for a 1 year old? Check out some of my suggestions. Sunday we put together Jameson’s play kitchen! Brian was cleaning out the basement and got tired of staring at the extra large box which we purchased a long time ago. 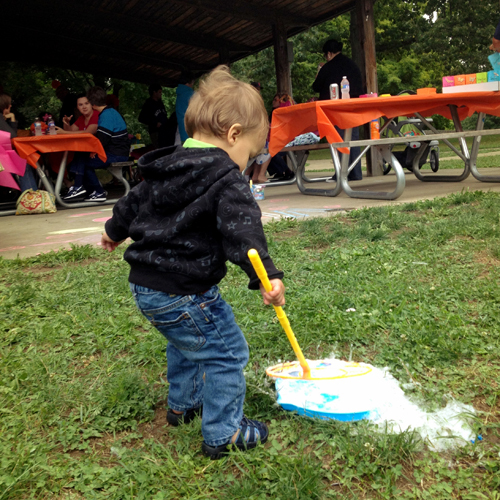 We did anticipate giving it to him before his birthday, when it got cooler out, so this was the right time! 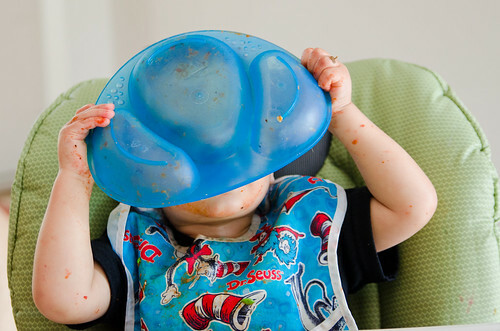 Since Brian does the cooking in our house, we thought Jameson might naturally want to imitate him this way. He will undoubtedly get tools and other traditional “boy” toys, but this item was insisted on by me, who enjoys the fruits of Brian’s labor in the kitchen. 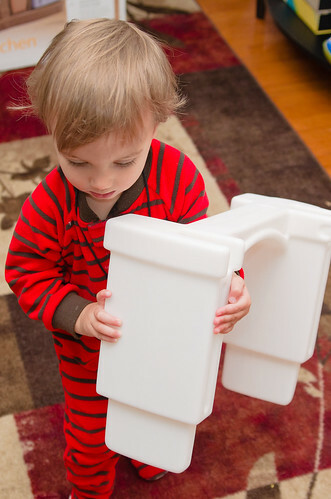 Also, I really wanted to encourage some imaginary play, since a lot of Jameson’s play is rough housing and activities like standing on stools, pillows, boxes and containers. Jameson insisted on being a helper while we built it. He would take pieces to Brian whenever asked, and wanted to use the screw driver to help put things together. He also knows the word “batteries” now and whenever something doesn’t work, he’ll say “battwies” and follows that with a “daddy” because I frequently tell him that daddy will fix things. So this time, I put in the batteries for the kitchen. 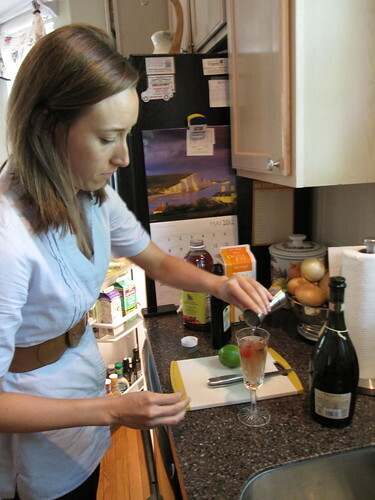 Once it was all finished, we had Jameson make us some broccoli, apple and bananas. The set came with food, and we went through each of them and Jameson repeated after me. 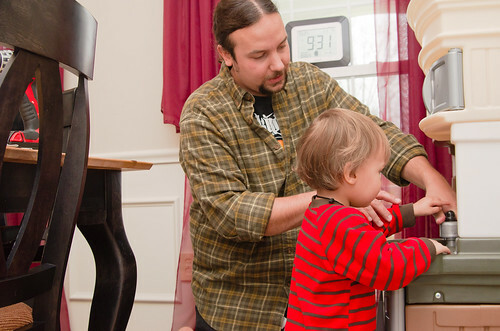 Me: Are you putting Mr. Bear in the microwave? Me: oh is Mr. Bear all done? Are you going to eat Mr. Bear now? 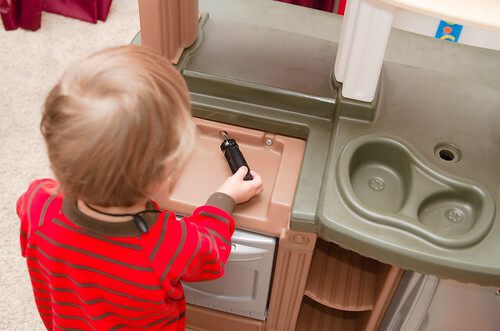 Before Trick or Treat, Aunt Melissa came over and they played with his new kitchen too. It’s fun to ask him for a fork, and he’ll run back to get it. 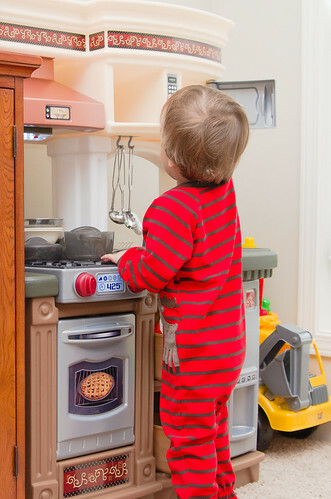 Surprisingly, he doesn’t use the burners which light up and make noise as much as the microwave, which doesn’t make any noise at all but he will press the fake buttons anyway. Pretty cute! We moved his toy box into the dining room for now since he’s not playing with much in there. So far, the kitchen’s getting a decent amount of use, even if he does like putting unrelated toys into the cubbies! 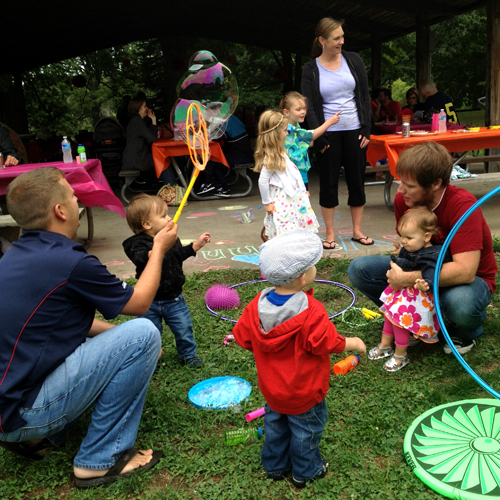 Saturday was Miss Vivienne’s 1st birthday party! It was unseasonably cool (in the 60’s) and neither Brian nor I knew that it was going to be held outside. So, when we arrived and discovered how chilly it was outside, Brian headed home for some jackets for Jameson and I. 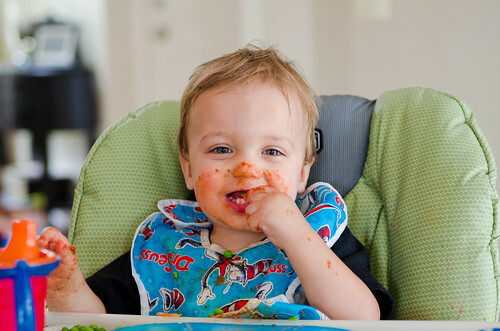 In the meantime, food arrived, and I imagined my terror toddler squirming out of my grasp and/or grabbing at the food to dump it all over me. 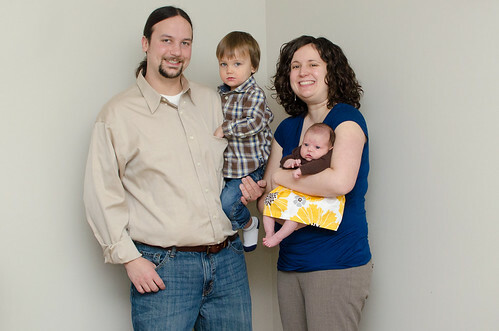 I was grateful that JP & Lisa were there with Jonathan so that if necessary I could have an adult helper! However, Jameson was in rare form, and sat still in my left arm while I also held the plate of food right next to him and which I ladled onto with my free hand. I was impressed with myself, for sure. He then sat like a little angel on my lap on the picnic table, eating off the plate politely with me. Pizza, blueberries, a little pasta. I also enjoyed the meatballs and chips and cheese dip, which Jameson tried at our second helping and enjoyed as well despite a little spice. Finally, Brian returned with our jackets, and while he ate, we took the kids off to play with the toys they had around! 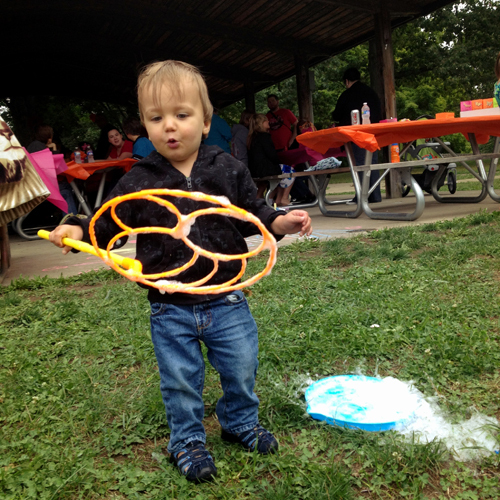 It was breezy, so it was easy for Jameson to “blow bubbles” by simply holding up the wand at the right angle. He was so excited. He loved playing with the bubbles. He didn’t try to dump out the bubble solution either. 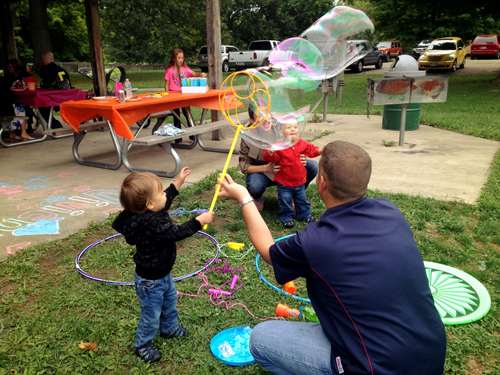 We were pretty impressed with his maturity; we’ve considering picking a big bubble wand up from the dollar store. It was a long time of entertainment, and would’ve been longer, except that we had to share. 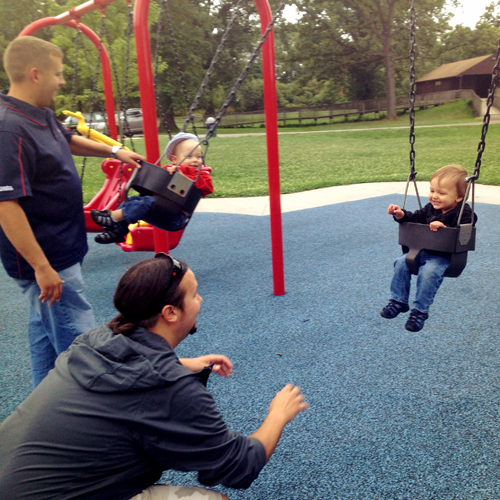 Before Vivienne opened her gifts, we took a break and went down to the nearby playground, which Jameson also loved. It was a perfect location for a birthday party! After break time, we headed back up for a diaper change and gift opening. I went with my practical-but-still-seems-frivously-awesome StrideRite gift card for shoes for the soon-to-be-walker, and then I also found this gem: Wooden Shape Sorting Clock. It says 3 and up, but the pieces didn’t seem too small for a 1 year old as long as that one year old isn’t insistent about stuffing their face with wood. Anyway, it seemed like a great grow-with-me toy, and our lucky day, this lucky lady likes to sort shapes like crazy so I’m sure she’ll enjoy it. Jameson was a champ, but since he had an interrupted nap in order to arrive in time for the party, he was starting to get a little antsy. He said goodbye to Vivienne’s mom Lisa, and gave high fives all around. He’s always adorably shy around Vivienne which makes me laugh. It was a great time, despite the cool weather (which I argue is better than 100 degree weather any day!). The location was ideal, and makes me wish Jameson’s birthday was in warmer weather. Oh well… we’ll just have to find other excuses to party in the summer! Sorry, I couldn’t think of any others. Is it sad that my excuses are all television??! I have photos in back log: This past weekend was full of fun with friends and family, but I haven’t gotten around to editing them, hence no posts about them, because I’ve been enjoying a ridiculous amount of TV time after Jameson goes to bed. I think that August will be a great month for us, and for Jameson too: He will be starting in the next room at daycare on the 20th this month. We are blessed that he has a teacher who wants to follow him (she is his favorite, and he is hers), so I think that the transition will be easier for him than it would otherwise. His friend Nathan, who has been out of daycare for the summer, will return soon too! 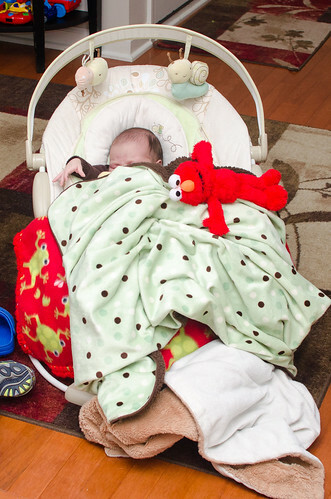 Every night when we come home now, Jameson wants to either play outside or watch Elmo. I’m happy to oblige: He will sit on my lap to watch Sesame Street for nearly 10 minutes before squirming his way out. It’s adorable, and I’m staying guilt-free since it’s Sesame Street, he’s spending time just resting with me, and he never watches TV at daycare. WIN WIN WIN. We got him new shoes for daycare which are sandals with covered toes that can get wet, and he loves them. Doesn’t want to take them off in the evening. It’s adorable. The neighbors had their new baby yesterday, and their mystery baby was a BOY! Peyton. In a year, I can see them all running around the backyard (which maybe by then will have grass, seriously). I left you at the end of rehearsal on Saturday, going back to the hotel room with Emma for the night. Brian was a good sport (well, he had a fancy executive suite with his points, so no hardship for him). 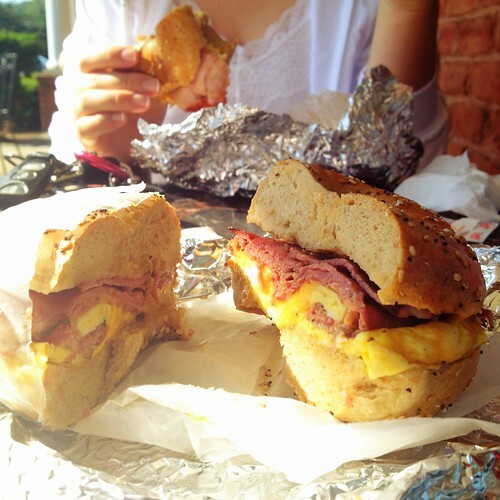 Sunday we woke up with plenty of time, and we had a hearty New Jersey bagel! I went all out and got an everything bagel with cheese, egg and PASTRAMI. So very excited; so very good. After breakfast, it’s finally safe to tell Emma: “It’s your wedding day!! 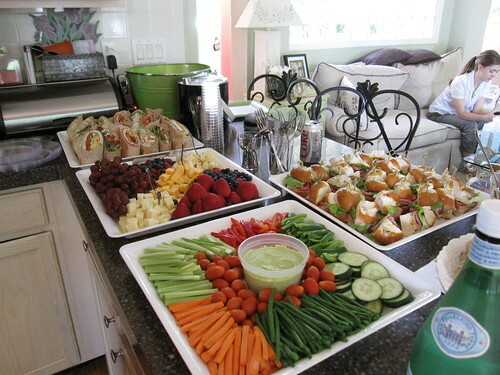 !” We headed over to her friends house where we were getting ready for the day. It’s Sunday, so the hair and make up ladies come to us instead of the other way round. We had quite a spread for lunch, and a great bridesmaid bartend-ress Shannon keeping us stocked up on Poinsettia Champagne Cocktails. Emma’s sister even played classical piano for a while while we waited. 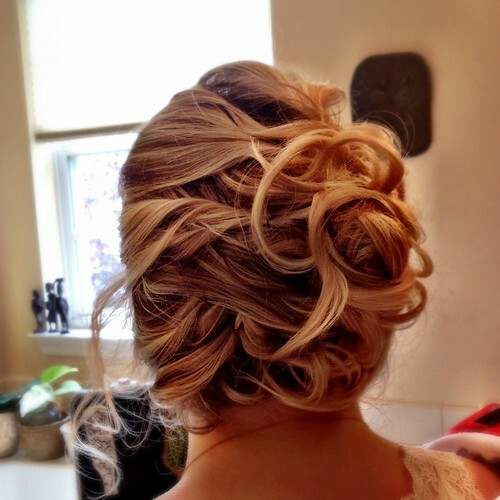 Emma was last to go to get her hair done, but the bride is never late, the wedding waits for the bride, right? We actually weren’t late though; we had plenty of time to get ready. 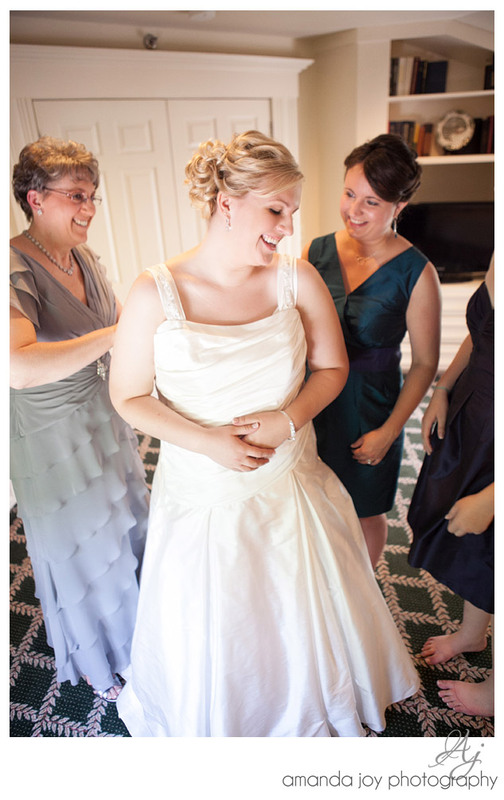 Emma gifted the bridesmaids with dark teal earrings and beautiful simple circle necklaces, as well as a clutch for which we chose our own fabrics! 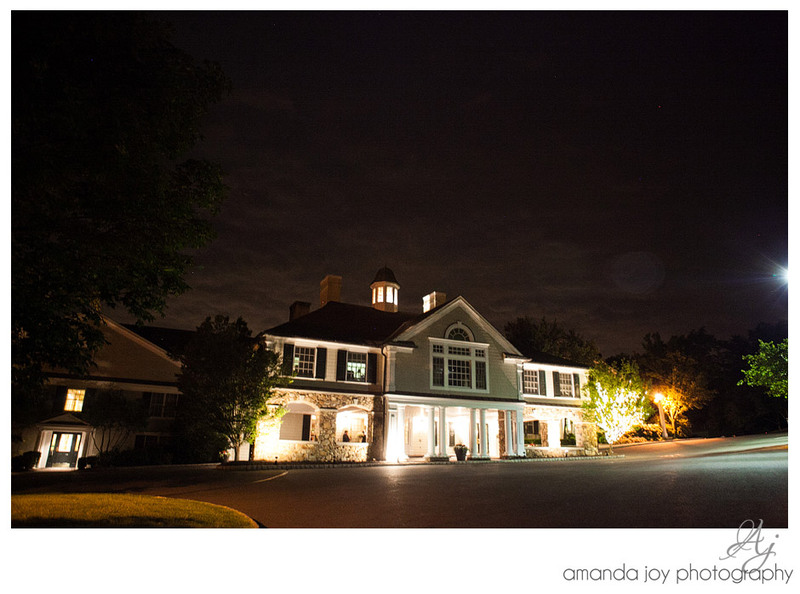 Emma got married and danced the night away at the Olde Mill Inn in Basking Ridge, New Jersey. The hotel was classic; the appetizers were amazing, and the drinks were flowing. 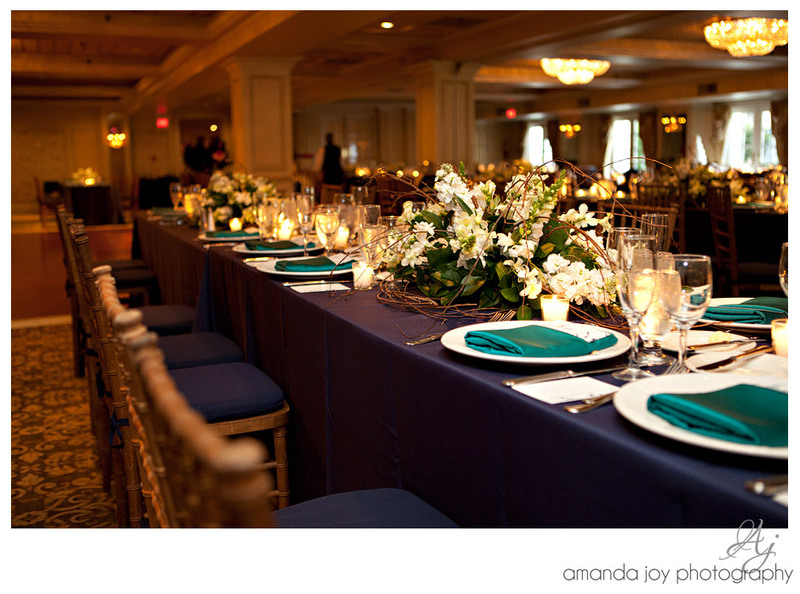 Emma’s table settings were lovely: Long rows of tables with a natural centerpiece and candles. It was very romantic. Emma and Joe had a sweet heart table, but I am not sure that they were able to eat much anyway! Did you know that they do things differently in New Jersey? They dance before, during, and after eating! 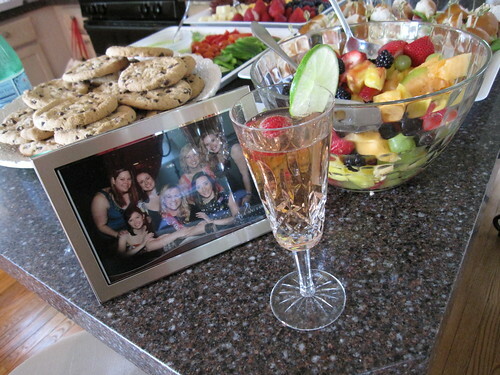 But before all that, we had the toast. I’ve known Emma a long time. We’ve been there for each other in the worst times and the good times, no matter the distance or time between us. And then she found her other half in Joe to share those important moments with. I have seen him become her friend and partner, in life and in love. 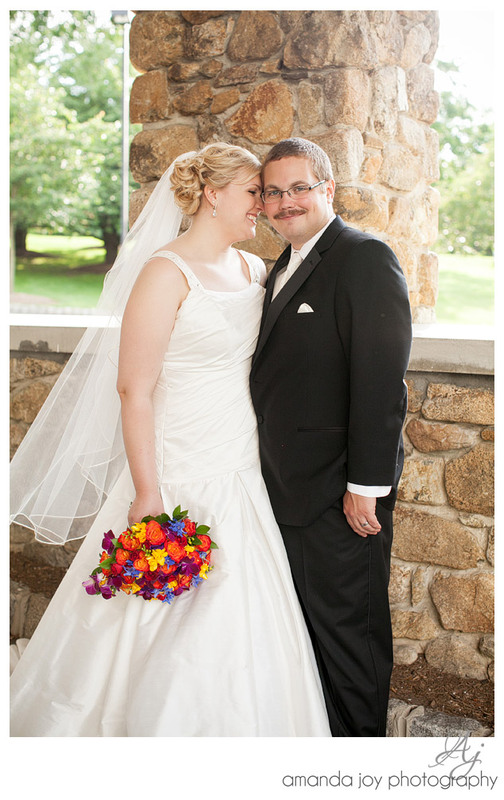 I am so happy to be standing here today, celebrating with them in the very best time of their life. To old friends and new beginnings, congratulations! I did tear up, for sure. 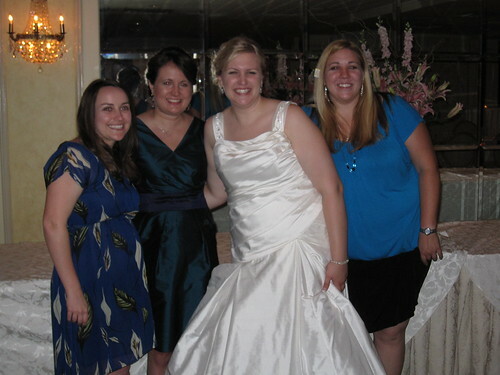 I was so excited to see friends from high school, Tara and Tracy there to celebrate as well! And then dessert: cake, cookies, or chocolate fountain. Which do you choose? All three, absolutely. 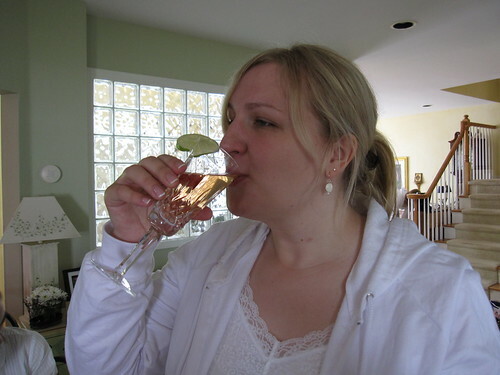 And another drink while you’re at it. Congratulations Emma and Joe! I hope you had a wonderful time on your honeymoon in the British Virgin Islands! …Not that kind of baby! 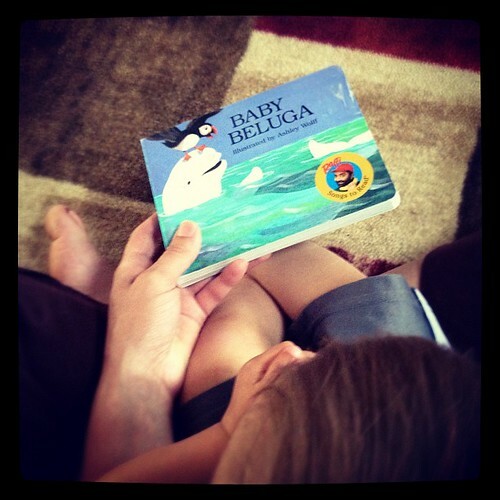 Jameson’s new favorite book is “Baby Beluga” from his Grandma; it’s a sing-along book based on the music by Raffi. I have asked most everyone I know now if they have heard of Raffi, and it’s about 1 in 20 who have. But I grew up on his music, so I didn’t even need the CD to be able to sing Baby Beluga to Jameson. It wasn’t too long before it became his favorite book, and one of the first books that has no soft fur to touch or pop ups to grab that captures his attention. One day, I sang it to him 7 times in a row. Yesterday, he was going through his book basket and he kept saying “baby” and swaying back and forth like we do when we sing. It was upstairs, so we had to go get it. Story time is my favorite time (as long as we’re not reading 10 Tractor and Truck books in a row. Let’s stick with the animal books, okay Mr. Jameson? ).